Picturesque scenery surrounds St. Margaret's Bay in Nova Scotia, Canada especially at sunset when a unique lighting glistens off the rocky shoreline. 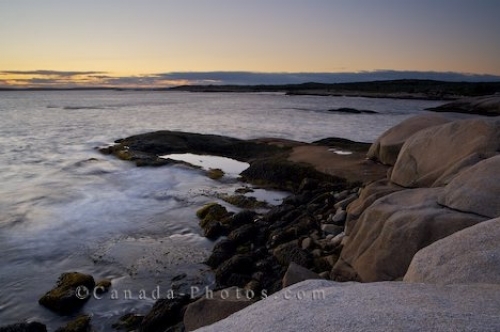 Standing at Peggy's Cove, small inlets run along the coastline as the sun disappears across the horizon. St. Margaret's Bay is a paradise for photographers as around every corner, scenic pictures are available. View of St Margarets Bay from Peggy's Cove at sunset, Lighthouse Route, Highway 333, Nova Scotia, Canada. Picture of St. Margaret's Bay at sunset from the rocky shore of Peggy's Cove in Nova Scotia, Canada.